Adam's H20 Guard & Gloss delivers lasting protection and unmatched gloss in a unique water-activated formula that is fast and easy to apply. The incredibly effective blend of acrylic resins and water activated nano-polymers leaves your paint slick and protected without the extra effort and hassle of traditionally applied sealants or car waxes. The optical grade polymers won't stain exterior trim, and even leave rubber and plastic looking darker and protected from the elements. 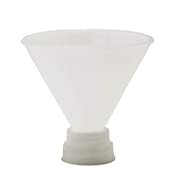 Application couldn't be more simple - apply by misting over a wet vehicle and spreading with a premium plush microfiber towel or go for the dry application, using a pre-moistened microfiber towel to apply protection and shine. 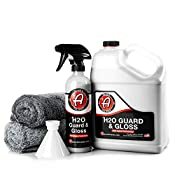 Regardless of the method you choose you'll agree that Adam's H20 Guard & Gloss is the easiest, fastest, and most effective way to seal your paint that you've ever used. Give your vehicle ceramic car coating like results in minutes. Once you experience Adam's Polishes H20 Guard & Gloss you'll never want to go back to applying protection any other way. ✅ THE MOST ADVANCED DRYING AID! H2O Guard & Gloss uses cutting edge technology to seal your paint as you dry! Safe on all surfaces, including glass-- Take your paint to the next level from a Spray Wax or Quick Detailer and protect as you dry! ✅ MULTIPLE APPLICATIONS! H2O Guard & Gloss can be used both wet or dry because of its unique bonding technology. Derived from our most successful Liquid Paint Sealant, this Water-Activated Paint Sealer adds a protective layer to extend the life of your current waxes and/or sealants. ✅ THE FASTEST WAY TO SEAL YOUR PAINT! 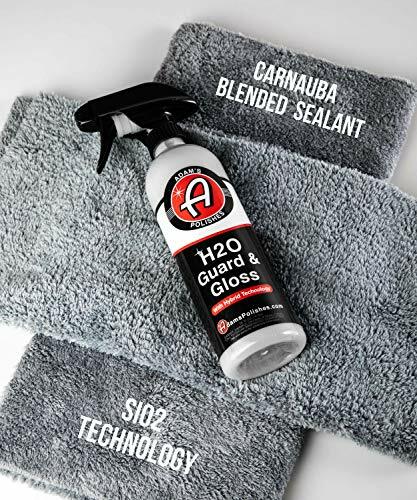 Not only does H2O Guard & Gloss give you ceramic coating like results in a few minutes, but you also have 3 month to 6 month protection applied as a stand alone water activated spray sealant! Use the included 2 Borderless Grey Plush Towels for best results. ✅ SAFE FOR ALL EXTERIOR SURFACES, INCLUDING TRIM! Darken your plastics, add depth to your paint and protect your shine in minutes. 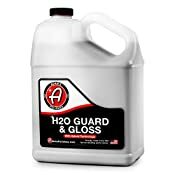 Adam's H2O Guard & Gloss uses the most advanced chemical acrylic technology to provide unmatched beading capability. ✅ 110% SATISFACTION GUARANTEE AND USA MADE! We pride ourselves on customer service and satisfaction and believe that this is THE BEST water activated paint sealant on the market! If you don't agree, we'll do everything we can to make it right.